← Bee Gee Fairy Tale Pt. III–The Ball and Concert! The last story from the Love and Hope weekend in Miami, this was the most difficult to write because of the emotional moments experienced as I walked into the past. Along with my fellow Love and Hope fans, memories were made. Here is what happened. I started getting butterflies in my core, stomach doing cartwheels, as we pulled up to the iron gates at the Hit Factory, formerly the iconic Criteria Studios. 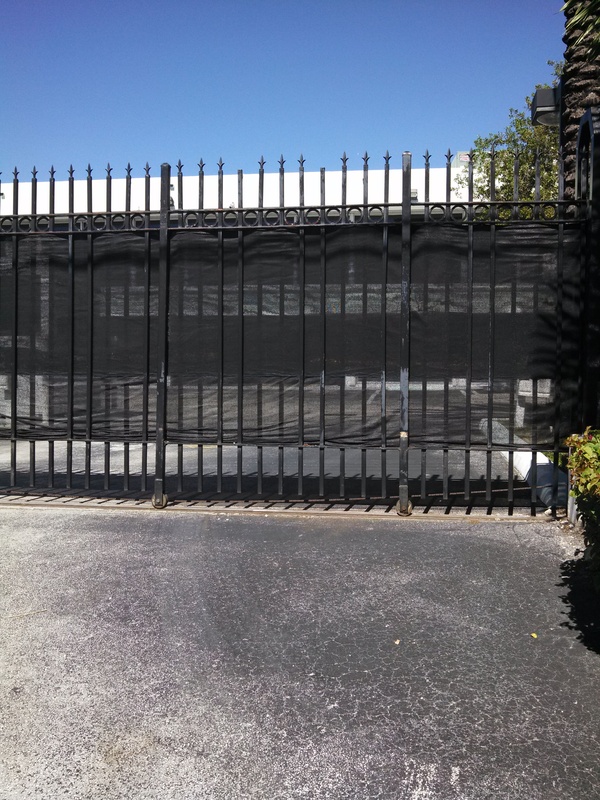 When I heard the grinding sound of the gates opening and we drove through and parked, I started wondering how many hundreds of times Robin Gibb had parked his car in the spot where I stood. Walking toward the doors, I thought of photos of Maurice Gibb smiling and waving as he walked through them on his way to a recording session. I envisioned Barry and the emotional mine fields he silently navigates and came to the realization that, discounting his supportive family, creating music is his oxygen, his way of seizing life and carrying on with passion, and this place is where so much of that creativity took shape. A smiling Dave, our tour guide and technical director, held the door open as we walked through. Inside the lobby, my emotions started playing ping pong in my head when I turned to my left and saw Andy Gibb’s face and the words “After Dark” along with the record, framed and hung on the wall. In an adjacent frame was the “Saturday Night Fever” album. John Travolta, in his famous white suit, right hand in the air, smiled at me. I hadn’t walked into a single studio yet, and here were the Gibb boys showing themselves and their influence on the music industry. It was silent at the moment, a quiet Sunday afternoon without the chaos that sometimes accompanies a recording session. The halls were dim, the air cool and the atmosphere calm and serene. I imagined the flurry of activity that must have accompanied Barry as he worked, and I thought of his dedication to creating exactly the perfect sound as it had played in his head. Only he knew what it had to be. How many hours had he sat in these rooms determined to have that sound duplicated? Each room is a different shape, and the sound varies according to the size of the room. Dave calls Studio E, “the Swiss army knife of studios with 96 channels.” Little Wayne has used this studio. 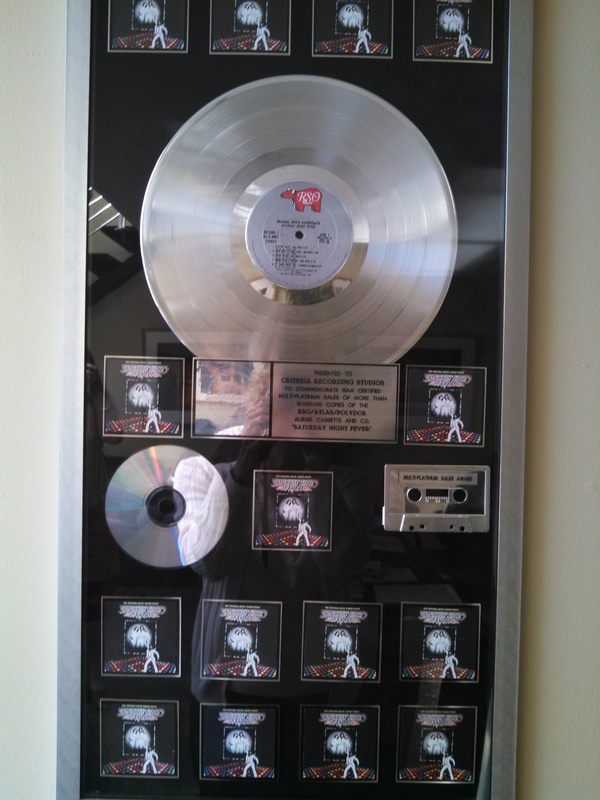 Birdman (Cash Money Records) is partial to Studio F. (Michael Jackson’s History album was done in there.) 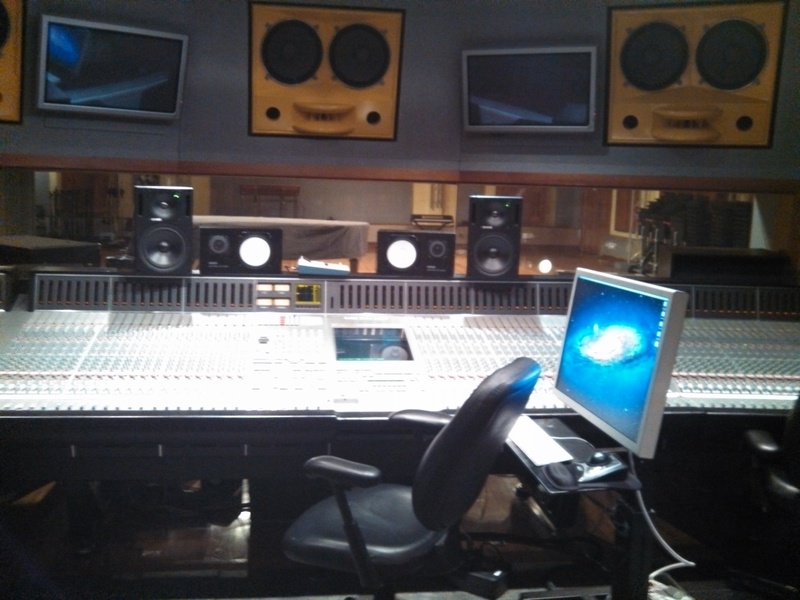 Studio C is the “vintage” studio with older equipment. The individual studios have their own lounges, and they are impressive, with flat screen televisions, kitchens, leather sofas, and even game rooms. As Dave mentioned some of the recent sessions and who was working in the building, I was more than impressed. Ricky Martin recently completed recording music for the upcoming World Cup. Jennifer Lopez, Shakira and Drake have been here. I was handling myself really well, even though I was in a room where James Brown’s “I Feel Good” was recorded and where Derek and the Dominoes produced “Layla”. Eric Clapton’s album “461 Ocean Blvd” and of course our boys’ “Saturday Night Fever” made history after being recorded here. I was in disbelief as I walked into a studio that I recognized. I could picture Barry, Robin and Maurice sitting at the consoles and felt chilled as I recalled watching video of the Bee Gees at work. 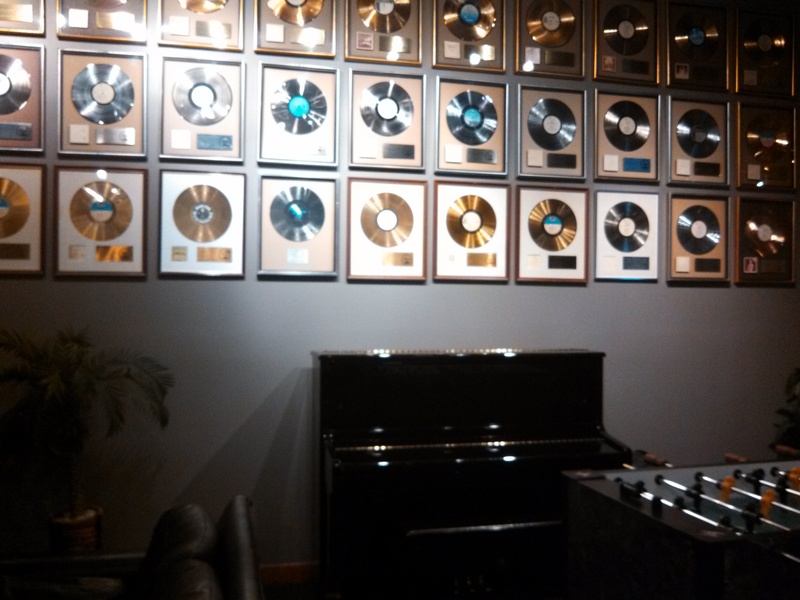 I was standing where they stood as they created some of their most successful hits. 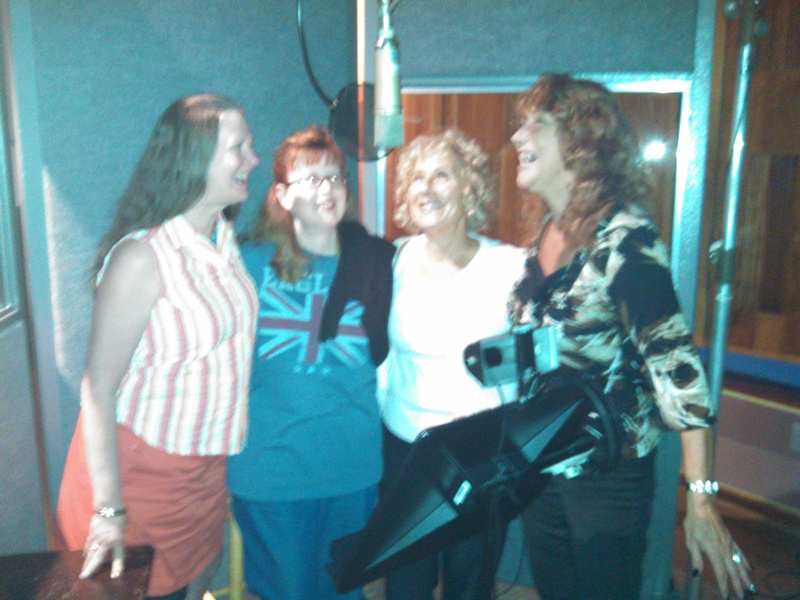 With the other three ladies on the tour, we stood behind the microphone where they sang, and it was a lighthearted moment as we tried to decide which Bee Gee song to sing. 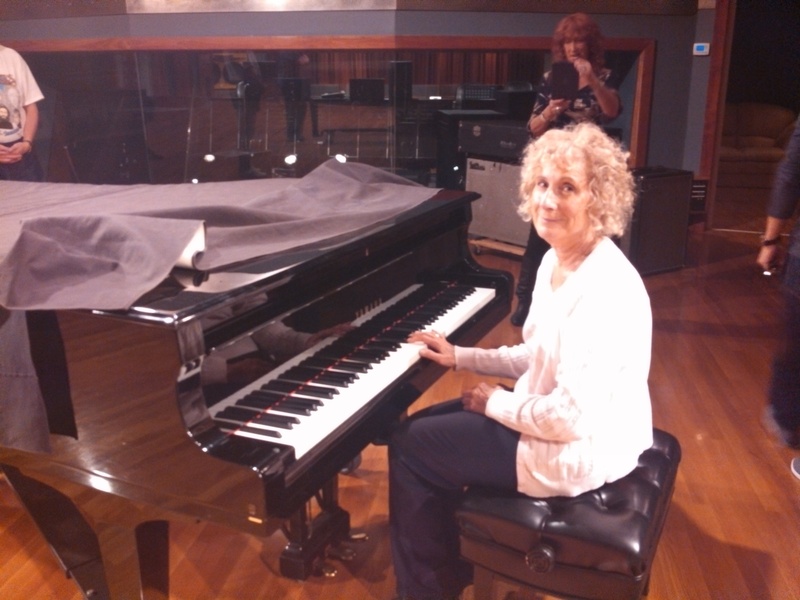 As we moved into the cavernous studio where orchestras record, I felt my throat constrict, and my heart sensed a millstone hanging from a rope wrapped around it, weighing me down, pulling at me, for there sat the concert grand piano, protected with a large, brown cover. Yes, I thought, it was the Big Baldwin! In an instant, I thought of Blue Weaver playing that piano and then I pictured Maurice and how much I loved seeing him play. Dave smiled at me as I sat on the bench. He gently lifted the cover and opened the piano so I could place my fingertips on the keys. I didn’t want to embarrass myself in front of the other fans; nevertheless, I failed at holding back my tears. Much of the genius of the Brothers Gibb had developed and grown in these studios. So maybe I was overemotional and histrionic, but I felt as though I was having some sort of a spiritual experience. Whereas Mo sits upon my shoulder and nudges me along gently, Robin takes little pieces of my soul and influences me with his intensity. They were hitting me with a double whammy at that moment, and I knew they were right there with me in that studio. Rising from the piano, I realized I’d just had a moment I would cherish for the rest of my life. As we walked out into the afternoon sunlight, I thanked Dave again for his time and his insights. My fellow visitors were equally grateful and had enjoyed every second of the tour. I was lost in my thoughts as we drove past the gate and it closed behind us. I thought of Barry and how he is the symbol of hope and resilience for Bee Gee fans. It was at that moment I understood how truly lucky I was to be a fan of the Gibb brothers. I had just walked the halls where they made musical history, and I felt privileged to do so. This one moment in time had affected me in ways I didn’t expect. 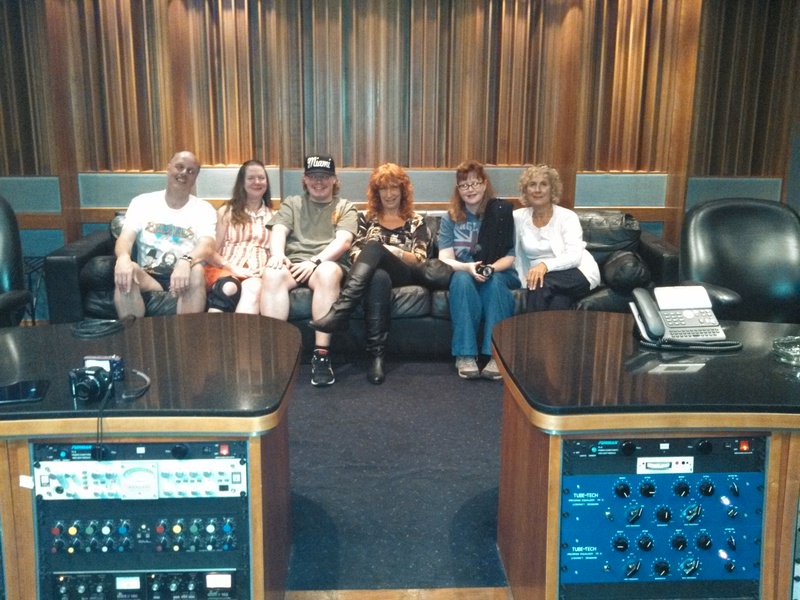 What happened through the creative talents of the Gibbs,within the walls of Criteria Studios, was beautiful, exciting, and dynamic; it changed the musical world forever, and we fans are the fortunate recipients of the best music ever written. The genius of the Gibb brothers will always live on. Beautiful sentiments. Thanks for taking us into that world. You are so welcome, Stacey…..thank you! I really enjoyed reading this. I couldn’t help but feel sadness. (I wanted to cry) You did a very nice job. Thank you. I don’t want anyone to be sad! Glad you enjoyed it….so tough to write about this place..
You are so welcome…thanks for reading the blog. I appreciate the messages about seeing Barry. What a great memory!